Airport Contractors Feel Sting Of FAA Shutdown The stalemate in Congress over FAA funding has stalled more than 200 airport expansion and renovation projects across the country. And it's putting tens of thousands of contractors out of work. He's no stranger to layoffs. A taut, barrel-chested man in his 50s, Zemlok spent 22 years at a local Toyota assembly plant before it was shut down last year. He says he hasn't seen much work since then. So he was relieved when he got a job helping build a new air traffic control tower at Oakland International Airport. Among other things, it meant Zemlok could keep his union medical coverage. "Our work, our hours on the job relate to our medical payments. My medical is about $1,400 a month, and if I'm not working then that has to be paid by somebody, or else I don't have medical coverage for me and my family," he says. "I couldn't believe it," he says. "You know, I just got out here after 10 months of going through this stuff and here's a one-year project and it's like, 'Sorry, no job. Go on home.' "
Zemlok laughs, but there's no smile on his weathered face. He's standing at the shuttered gate of the job site. 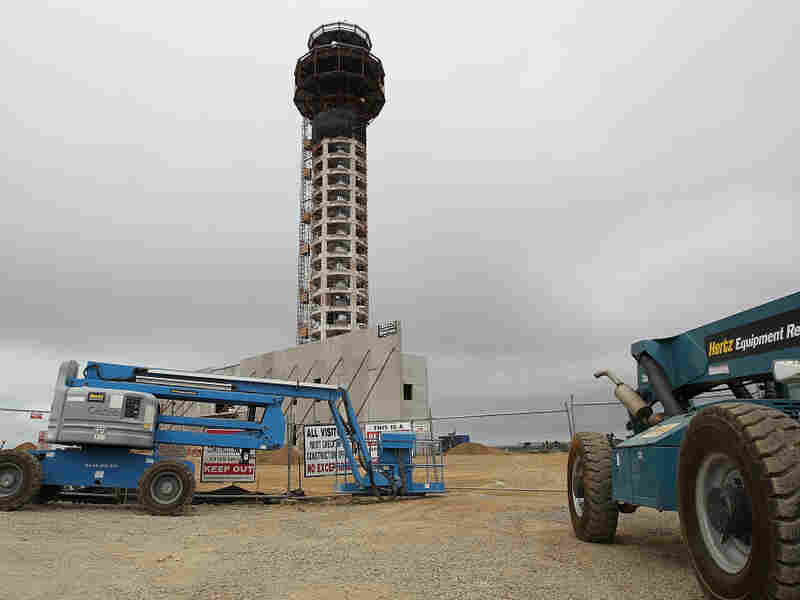 It's just a stone's throw from the skeleton of a 236-foot, state-of-the-art air traffic control tower. "I just want a job; I just want to go to work; I want to be productive," he says. "I don't want to sit home. I want to pay my bills; I want to pay my taxes. I want to do what's right for America." "I'm trying to do the right thing, and it seems everywhere you turn something gets shut down for some political reason," he says. Oakland's frozen airport project is one of five in Northern California and many, many more across the nation that add up to more than $10 billion of lost work. I just want a job; I just want to go to work; I want to be productive. I don't want to sit home. I want to pay my bills; I want to pay my taxes. I want to do what's right for America. "If we can't expand and modernize our port and make it more efficient for more flights to come into Oakland, that will hurt our goal of increasing tourism long run," she says. "It hurts immediate jobs; it hurts long-term jobs. And it's not necessary. There's no reason why Congress can't move this forward and why they shouldn't have moved it forward months ago." "This is not the way to treat people who have worked very hard," he said. He noted that the construction sector has been particularly hard hit. Ashley Davidson, 24, knows that firsthand. She's a first-year electrician's apprentice. She thought the skill would guarantee her work and a career. Now Davidson wonders why Congress can't do its job. She says she thinks Congress doesn't get it. "People who aren't middle class, who don't really know what it is to work a good, hard day, people who have no concept of what it's like to be without health care — who have no concept of what it is to work hourly, to work paycheck to paycheck." As it stands, Davidson and her fellow workers won't be back on the job at least until September when Congress returns from its recess.